In addition to his writing, Mark Winne maintains an active speaking schedule that includes keynote speeches for annual meetings and conferences, talks and trainings for smaller gatherings, and lectures for colleges and universities. Topics include domestic hunger and food insecurity, public health, sustainable agriculture, social and food justice, food democracy and food sovereignty, the role of public policy in promoting social change, and empowering individuals and communities to take charge of their own destinies. 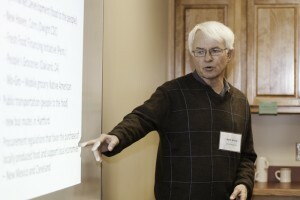 Drawing on his 40 years of community food system experience, Winne mixes inspirational messages with themes of active citizen engagement, challenging the status quo – especially the industrial food system – and what we must do, both individually and collectively, to regain control of our food, bodies, and communities. The section About Mark Winne provides information on his background and experience. The video and audio clips at the bottom of this page provide a glimpse of his style and ideas. Mark Winne uses a flexible fee schedule to make it possible for a variety of organizations to use his services. Speaker fees can also be adjusted if the contracting organization agrees to purchase Winne’s books for resale or other forms of distribution in association with the speaking events. Generally, expenses include reimbursement for economy airfare from Albuquerque, New Mexico to the designated location, ground transportation, and lodging and meals in accordance with the required time at the location. Post-training evaluations of Mark Winne’s presentations typically receive positive to very positive responses from 85% to 99% of the participants. And his trainings always achieve results. 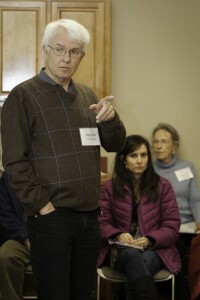 In a June 2012 food policy council workshop in Rochester, NY, 80% of the participants (65 total) indicated they would significantly increase their commitment to or change the focus of their food policy work as a result of his workshop. For more information, use the contact page to send an inquiry or call (505) 983-3047.